To design gardens that shine in shade from spring to frost, fill your beds and borders with perennials that bloom in fall as well as plants for spring and summer. As the gardening season draws to a close, late-blooming perennials are a special treat, wherever they appear. While not as many plants bloom in shade as in sun, there are still handsome choices for planting in shady beds and borders. Don’t forget perennials with outstanding foliage in your efforts to add character to fall shade gardens. Hostas still rein supreme, but a number of perennials also offer colorful fall foliage, including variegated fragrant Solomon’s seal (Polygonatum odoratum var. thunbergii ‘Variegatum’), which turns a lovely pale yellow. You can add a temporary spot of color to a shady site with fall mums, but to create the progression of bloom that makes a perennial garden so appealing, include some of the flowers listed below in your plantings. They are beloved border and meadow plants, but there are species for shade gardeners, too. Blue wood aster (A. cordifolius), also called heart-leaved aster, bears clusters of ¾-inch flower heads in pale lavender or white. Plants range from 2 to 5 feet and bloom from late summer into fall. White wood aster (A. divaricata) bears clusters of white, ¾-inch daisies from midsummer through fall on 1- to 2-foot plants. Large-leaved aster (A. macrophyllus) produces clusters of 1-inch-wide, white to pale lavender flowers from late summer to fall. All are native North American wildflowers hardy in Zones 4 to 8. Pinch or shear any of these in early summer to encourage branching and bushy growth. North of Zone 6, don’t pinch after about June 15, or you may pinch out the flower buds. Don’t pinch after July 1 from Zone 7 south. It also called kamchatka bugbane and autumn snakeroot, produces fragrant white flowers in fall. Individual flowers are tiny, but they are borne in showy 3- to 12-inch-long racemes. For an extra shot of color in shade, look for maroon-leaved cultivars such as ‘Brunette’. Zones 4 to 8. They begin flowering in summer, but are spectacular in fall as well. Plants are 2 to 2½ feet tall with handsome wing-shaped leaves that are green above and maroon beneath. The small pink flowers are borne in showy, arching clusters. The variety alba bears white flowers. Hardy begonias grow from small tubers found in the plant’s leaf axils. Collect them and treat them like seeds or bulbils (plant them in pots indoors in a bright window for germination) or spread them in the garden where they will grow the following spring. Zones 6 to 10; to Zone 5 with winter protection. They are best-known as late-blooming plants for full sun, but a few species are suitable for shaded sites. Of these, the most commonly available is wreath or blue-stemmed goldenrod (S. caesia), a 1- to 3-foot-tall native species that produces tuftlike clusters of golden yellow flowers in leaf axils along its stems. Plants bloom from late summer to fall and are hardy in Zones 3 to 9. Zigzag goldenrod (S. flexicaulis) also grows in shade. Plants are 1 to 4 feet tall and also have stems that zig-zag. Short stems carry a cluster of golden flowers at each leaf axil. Zones 3 to 8. They are handsome, often overlooked, perennials for shade. Several species, including T. formosana and T. hirta, as well as hybrids are available and well worth adding to shady beds and borders. T.hirta is 2 to 3 feet tall and plants bear green leaves and upward-facing, funnel-shaped flowers in leaf axils along the stems. Blooms are white or pale pink and spotted with purple-pink. ‘Miyazaki’ bears white flowers. T. formosana features green leaves spotted with dark purple and starry-shaped flowers at the tips of the stems in white to pinkish or purplish white. Both species are hardy in Zones 4 to 9 and spread by rhizomes to form nice clumps. 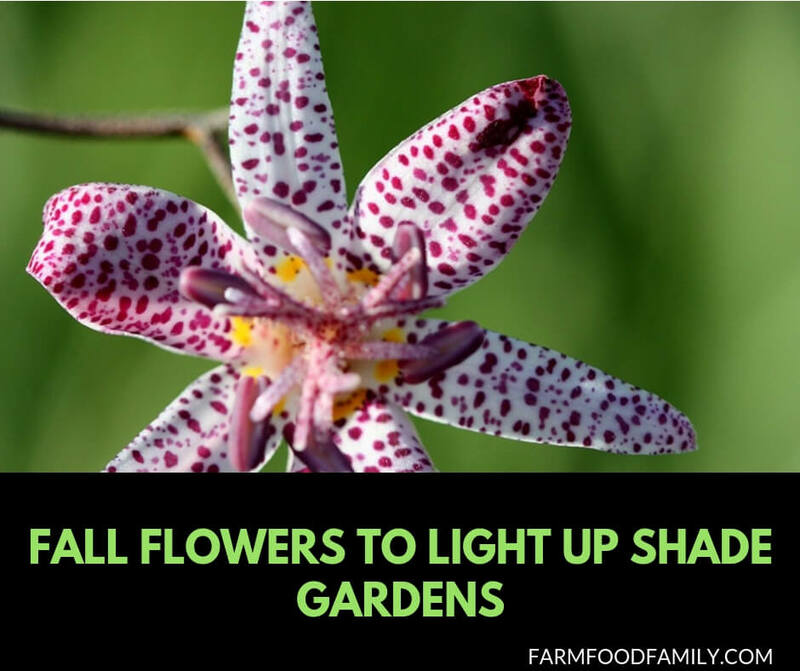 Hardy bulbs offer an easy way to add extra color to a shade garden. Plants that belong in two different genera are commonly called fall or autumn crocuses: Colchicum spp. and Crocus spp. Most produce their foliage in spring. Plant the bulbs in summer or very early fall as soon as they are offered by bulb companies. Most require a site with dry soil in summer when they are dormant. By choosing shade plants that bloom in spring, summer, as well as fall, you can design gardens that sparkle for the entire growing season. To keep plants looking their best, be sure to add organic matter to the soil before planting and keep beds mulched. Then be sure to take time to enjoy the progression of flowers.